No more spinning your wheels trying to figure out how to leave your abusive spouse. Have you ever wished you had the perfect guidebook that would give you step-by-step information to help you carefully plan a swift and safe departure from your emotionally abusive spouse and help you prepare for getting a divorce – at the same time? Here it is! In I Just Want Out, Jodi Schuelke combines detailed practical information with her personal experiences and the lessons she learned from strategically planning her exit (along with her children) from her emotionally abusive first marriage. 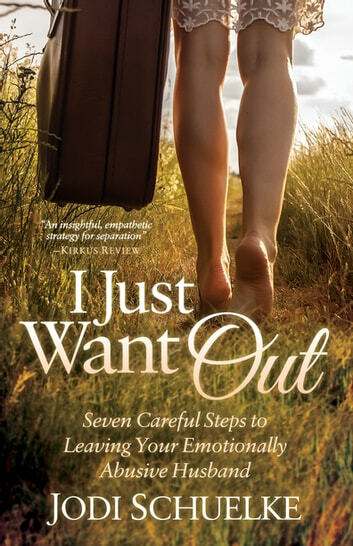 I Just Want Out expands on the information found in such books as Stop Walking on Eggshells and Splitting, by providing pre-departure and pre-divorce planning and details about what to do, when to do it, how to do it, and why it’s important. Jodi will support you and travel beside you on your journey to freedom using her practical seven-step FREEDOM Framework process.